So far, e-mobility has not experienced the big breakthrough. One of the reasons for this is that the charging infrastructure is in the beginning of its time. For many car drivers, the possibilities of electric refuelling are not sufficient. Easelink wants to change that. The Graz-based company has developed “Matrix Charging”, a charging system consisting of two components. A charging pad is mounted on the parking lot, which is connected to the power grid. On the underside of the electric car there is a connector that lowers onto the pad when parking. Power transmission starts automatically, without the driver having to connect a cable – similar to inductive charging, but with up to ten times the charging power and 99 percent transmission efficiency. During development, the designers have to slowly approach a production-ready component via several prototypes. If costs and time get out of hand during this period, prototype production can become a stumbling block. But Easelink has shown their skills in manufacturing the components. The gears in the mechanics of the connector prototypes were manufactured by a 3D printer. Configure gears online in 60 seconds? For construction engineers, this means that they won’t have to spend a lot of time on complex gear designs in the future. A further advantage in terms of economy is the fact that there are no tooling costs. The designer only has to select the tooth module and define the number of teeth and the torque transmission. 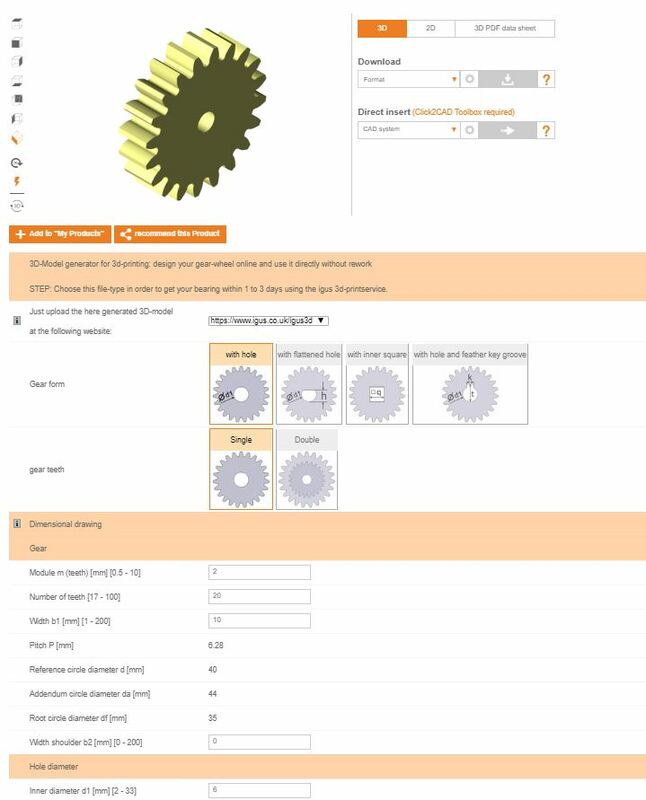 The configurator creates a 3D model of the gear, the basis for 3D printing service Without computer-aided design (CAD) software, hundreds of variants of single and double gears can be created. gear configurator – get your gear model in 60 seconds. 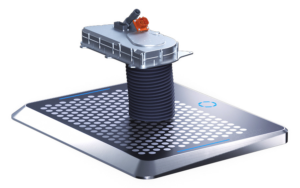 The iglidur I6 is particularly suitable as printing material for gear wheels. The high-performance plastic withstands ambient temperatures from -40 to +80 degrees Celsius, is pressure-resistant up to 44 Mpa and has a high abrasion resistance. Laboratory tests have shown that it is much more robust than the classic plastic polyoxymetylene (POM). Gear wheels were run at 12 revolutions per minute and loaded with 5 Nm. The result: The 3D-printed gearwheel made of iglidur I6 was still fully functional after one million cycles, the wear hardly measurable. A milled gear wheel made of POM was different. It was worn out after 321,000 cycles and broken after 621,000.